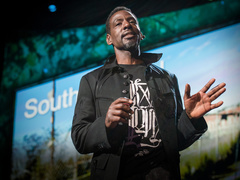 Ron Finley: A guerrilla gardener in South Central LA On the TED2013 stage, Finley described getting a citation for planting a vegetable garden on his curb. His next battle: pushing for more vacant lots to be turned into community vegetable gardens, so people can learn the self-sufficiency of growing their own food. “It shouldn’t be abnormal,” says Finley. Watch the video. Get with the movement. Reblogged this on Where do the Children Play…?. Reblogged this on The Earth Mama. Very good! Three cheers for L.A. today! Look under my gardening category on my site and you will see an article with pics about the front yard gardens. Lovely. We have city ordinances like these. We know many who have turned their front yard into veggie gardens down here (Orlando), in violation. We go out to lake Eola here in Orlando on Sundays and feed the homeless, also against city ordinance. Usually big pots of soup or stew with cornbread. The city says that it encourages panhandling….something else they have restricted to certain places at certain times of day. This is a great initiative – props to Ron Finley for his vision and success and good move by the council. Beautiful. Great story showing the difference individuals can make. awesome, the city should look at this way, no need to mow the curbs anymore and no more worries about hungry poor people, if everyone is allowed their own garden it sure helps with hunger, and that is what gov always claims they care about irradicating right? os they need to put their actions where their mouths are. that garden is beautiful. Taking control of their own lives and resources! This is a vicotry for urbanites in Los ANgeles who are trying to grow their own food! Well done, my hat is off! Some great news for a Friday morning Ron Finley, “the renegade gardener” of L.A., has just one the motion to amend the ”Residential Parkway Landscaping Guidelines” which prohibited community gardens in unused public lands.